A Bagworm is a perennial moth like insect that resides on a number of evergreen as well as junipers in its larva stage. It causes extensive damage to plants and trees. Bagworms winter over as eggs in the bag of the female from the year before. Therefore, your first measure of control can come by hand-picking all the bags from last year. These eggs hatch mid to late May through the end of June. Individual larvae drop from the bag on a strand of silk and either swing onto a branch or sail in the wind to another tree. Immediately upon landing, they build a silk-lined bag, often decorating it with bits of foliage. Larvae remain in the bag feeding, with only the head and thoracic segment extending out. They are very small when they hatch, as the larvae grows, the bag expands the protective bag to accommodate its size. In mid to late August, feeding will stop, and in two to three weeks, adults emerge. Females remain in the bag looking like a slug. Males become a winged moth flying to the females bag and mating. The male dies, the female will lay up to 1,000 eggs in her bag then dies as well. It is best to use some method of control before they get to the egg laying stage in September or October. The bag will protect the eggs until the following spring. Cedar, pines and other evergreens are popular hosts for the worms to feed on; however, they will feed on several types of trees and shrubs. They can sometimes be mistaken for small pinecones on pine trees. Plants can become unsightly when a large number of bagworms attach and feed on the same tree or shrub. They can also become unhealthy or die if too much of the foliage is removed so that the plant is unable absorb enough energy from the sun. The absolute best control for bagworms is Fertilome Borer, Bagworm, Tent Caterpillar & Leafminer Spray. This is a natural product so is very safe for kids, pets and wildlife. 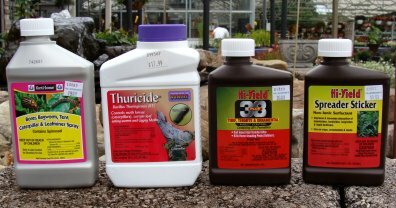 The next best product is also a natural product, Thuricide. These are both only effective on worms and caterpillars. Always make two applications 10 to 14 days apart. Also, due to the silky webs holding the bag together, add Spreader Sticker to the mix to increase adhesion, penetration and residue length. Direct the spray from the tip of the plant to the inner most part of the plant. When the bags are over an 1½ inch long, the above controls are less effective, at this point you need to use Hi-Yield 38 Plus. Again, add Spreader Sticker and make two applications 10 to 14 days apart. Since the adults die and leave eggs in the protective bags, spraying in the fall is not effective. You can still remove the bagworm bags from the host plant at this time and dispose of them. Then, be sure to spray with one of the products mentioned above in mid to late May once the eggs have hatched.